Run down a list of synonyms for eyesore and you’re bound to check off a number of phrases used to describe Buffalo’s Skyway. The elevated roadway has been the subject of debate for the last number of years as the clamor to bring it down continues to grow louder. The arguments for its removal are obvious and well documented. It’s an antiquated roadway that not only causes headaches each year (due to its lack of shoulders) but now stands as a barrier against waterfront development in Buffalo as the roadway’s supports stand in the middle of prime space in the Outer Harbor and Canalside neighborhood. Plans to, at the very least, introduce an at-grade harbor bridge are moving along (slowly) with the goal being to provide a better alternative to using the Skyway for travelers on Route 5. While the Skyway’s replacement is still at least two, if not three years away, it’s time to take serious action towards removing the Skyway as well. Among the areas that will benefit most from removing the Skyway will be Canalside, as the parcels along the Central Wharf will be completely free for development as opposed to how they appear today. However, the corner of Pearl and Seneca Streets will also see a massive amount of space open up thanks to the removal of the ramp connecting the Skyway to the 190. Three areas on Pearl St. along with another that runs along Perry Blvd. will be open for business after previously sitting relatively dormant under the Skyway. These blocks could serve as an extension of Canalside and bridge the growing district with the downtown core. Without any specific residential plans set for the area around Canalside at this point, these blocks – particularly the current parking lot across from Pearl St. – could be developed as residential infill to continue to draw permanent residents to this portion of the city. The areas currently impacted by Skyway ramps that would be opened to development if the road was removed. I could see a block of three or four-story row houses lining Pearl and Seneca with parking for residents built within the confines of the block itself or even underneath the project. The latter would allow for the homes to be built on top of a single floor parking structure with the interior of the block serving as a courtyard for the buildings. The homes could potentially extend right to the corner of Marine Drive under the right circumstances with only the 190 separating the area. The 190 will remain as a stumbling block, but with the Skyway removed, the overall impact of the elevated highways would be drastically decreased. And since removing and rerouting the 190 would be a multi-billion dollar boondoggle, accepting it’s presence would be a small price to pay should the Skyway get the kibosh. 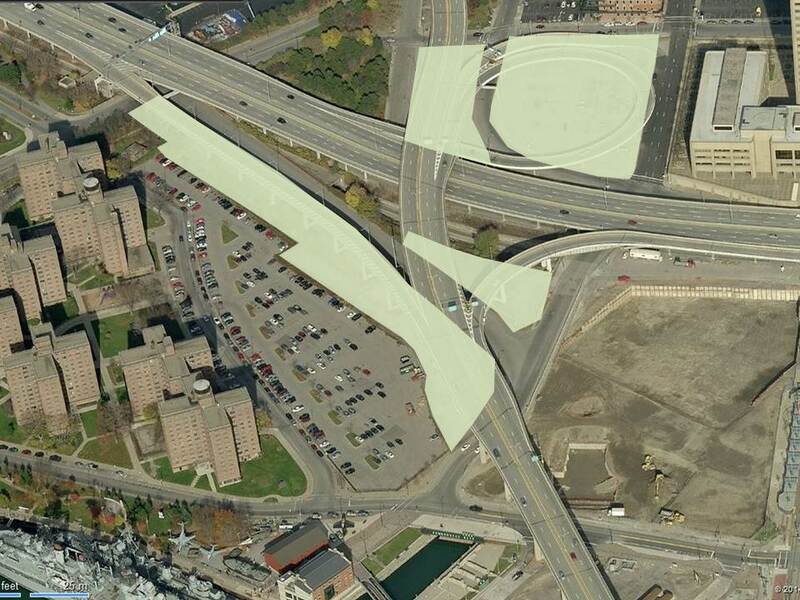 In fact, the area directly underneath the 190 could be easily upgraded with a few simple tweaks that would include the incorporation of Canal Era artwork, lighting at night and other basic changes that would alter the overpass from an unkempt, intrusive structure to a welcome gate to Canalside. Tying those tweaks to the 190 underpass in with newly cleared blocks on Pearl would drastically change a section of downtown from a mess of steel and one way streets, to an open area ripe for new development. Add in those row houses (or something similar) and you’d have an exciting addition to an already burgeoning section of the city. The rest of the Skyway can go away for all I care. However, I feel that there could be the potential for reuse for the section over the river if it’s done correctly. To be specific, any portion of the Skyway from its initial footprint in Canalside through to downtown, along with the area over the Outer Harbor can and should be removed immediately. However, the section over the Buffalo River and City Ship Canal could serve like Buffalo’s version of The High Line. The green area would remain as the Skyway Park while the red sections would be removed to free up development. 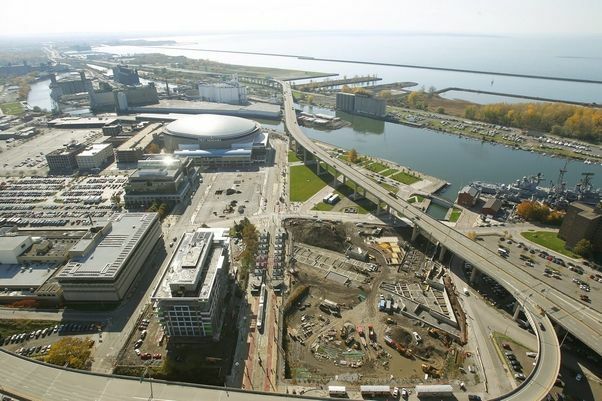 As illustrated (poorly) in the attached picture, I could see leaving the very first footing near First Niagara Center and Clinton’s Dish along with the first few over near the Outer Harbor along with everything in between to be kept as a Skyway Park. It wouldn’t need to be anything special and with a few tweaks and additions could have observation decks to stand on in a similar fashion to the Shelby Street Bridge in Nashville, TN. Access points from both sides of the bridge could be a combination of stairs, elevators or even ramps should the footprint remain minimal. Any ramp would likely need to remain on the Outer Harbor side as space is already so tight on the downtown side. Such a plan would conceivably save some of the demolition costs associated with removing the entire roadway while giving Buffalo a very unique urban park to complement all the other developments occurring downtown. The lighting project that is underway could still involve the remaining sections of the Skyway and the additions or renovations to make it more pedestrian friendly could bring a contemporary element into play. Simply removing the Skyway makes too much sense not to carry out. Acres and acres of space would be freed if the roadway was removed and the potential for the Harbor Bridge that is supposed to replace it could add an interesting signature to the city. Going a step further and repurposing a portion of the roadway might be a massive challenge but could add an incredible wrinkle to our growing waterfront. Why not build a better bridge instead of simply tearing the skyway down? Yes, I agree that the Skyway is an eyesore, and that it’s aging, but it’s still a very important corridor for traffic to the SouthTowns. Also, it seems too difficult to build an alternative bridge route that will adequately serve the growing needs of the outer harbor. So I propose replacing the Skyway with a newer bridge that will also have capacity to take on traffic from pedestrians and a potential Metro Rail extension be built, in addition to building a more up-to-date highway on top.